pecific Collisions is the second presentation by artist Melissa Gordon in an on-going series that addresses the construction of reading artworks within the frame of the exhibition format. Taking its title from both Donald Judd's Specific Objects and Mina Loy's play, Collision, the exhibition considers artworks in their signifier roll: re-ordering a language of interaction between the containing architecture and the works as things, which are adjusted by the circumstance and moment of viewing. The history and lore of The Shining, Stephen King’s book turned seminal horror movie by Stanley Kubrick, serves as a touchstone for the exhibition. The Overlook Hotel, in both book and film, is a metaphor for the mutability of memory; the repetitive maze of hallways and doors confuses, disorients and sets the ground for unexpected encounters. In Kubrick’s version, a large hedge maze is used as the locus of high suspense scenes, meanwhile omitting the topiary of King’s version, which animated and moved whilst no one was looking. 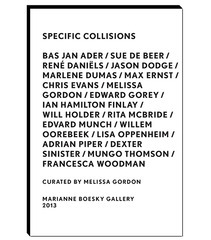 Specific Collisions is an exhibition where time is of the utmost importance while looking. Overlaps and repetitions of experience occur, while time in some manner elapses in all of the works— the artist documents herself while reading Kant's Critique of Pure Reason in Adrian Piper's Food for the Spirit, though no narrative or sequence readily progresses. A piece of fabric is caught mid-drop in a Francesca Woodman photograph. A pointed reference to TIME, the magazine and the metaphor, is found in Mungo Thomson's drawings. The time of art history runs beneath and between the works as well: Edward Gorey's pen and ink drawings are paired with Max Ernst's collages from Une Semaine de Bonté, referencing the artists’ mutual regard for one another. And within the space of the show is a flat representation of time itself, as objects come together from radically different histories to act in tandem, creating an uncanny sense of confluence. Underscoring this throughout the exhibition is the sound of a heavy mechanical alarm clock from the mid-1800’s, borrowed from Gordon's late grandmother's collection: a coincidental overlap being that she was Stephen King’s English teacher for a time in rural Maine. The exhibition contains another smaller display within itself, as the building frames three nearly identical installations in its seemingly similar, vertical galleries. The trio of Rita McBride's Middle Managers, Willem Oorebeek's Pirelli Portraits and Thomson's TIME drawings speaks to a reflecting, negative space. These objects are both recognizable and blank: mirrors of real things altered and adjusted. The repeat lays out the theme of the double-take throughout, starting with a René Danïels double silkscreen in the entrance and spilling out into the rest of the show. The re-iterations speak to the sense of something changing whilst not being directly regarded, and point to the importance of the gaze in the themes that run throughout the works surrounding the inner exhibition: the body as stand-in for a thought in Bas Jan Ader's photographs, the weight of presence of something unseen in the sculptures of Jason Dodge and Chris Evans, the physical sense of a trace or evidence in a formal object in Lisa Oppenheim and Melissa Gordon's collaboration and in Sue de Beer's flickering film, the Droste effect on language and representation in an artist book of Ian Hamilton Finlay and Dexter Sinister wall text, and the arresting nature of a reciprocal gaze in Edvard Munch's woodcut and Marlene Dumas' pietà Two Women. The gaze, in complicating the relationships of signifiers, is underlined and repeated within the exhibition’s catalogue, which serves as a reader for the show. A new text by Will Holder utilizes a linguistic structure from Laura Mulvey's Visual Pleasure and Narrative Cinema to read through the web of gendered gazes in the short film Making the Shining by Vivian Kubrick, Stanley Kubrick's daughter, who was a budding teenage filmmaker on the set of The Shining.